Pain Physicians NY (Brooklyn, NY) is one of the first practices in New York to offer Platelet Rich Plasma (PRP) Injections for patients suffering with knee pain. Our facility equipped with the most advanced, cutting edge equipment to treat pain. Our Brooklyn pain specialists are best in region. We were selected to be a part of the international medical team for the Rio Olympic Games. Degenerative arthritis is also known as osteoarthritis. It is a medical condition characterized by a wearing and tearing of the natural cushions between the joints. When these cartilages wear away, the bones tend to rub closely to one another. This rubbing between bones will lead to pain, swelling of the joint, stiffness, less movement of the affected joint and even formation of bone spurs. Every joint in the human body can be affected from osteoarthritis, so knee joints are not an exception. Degenerative arthritis is more common in women, especially over the age of 40 or even older. This medical condition is more common among people who are obese, who suffer from another joint disease like gout or rheumatoid arthritis, who have had a knee surgery before, who have had a knee injury before, who have other family members or parents suffering from degenerative arthritis of the knee, or even people who do physically demanding jobs, that require hard and repetitive activities. All these above mentioned factors increase the risk of degenerative arthritis and cause it. 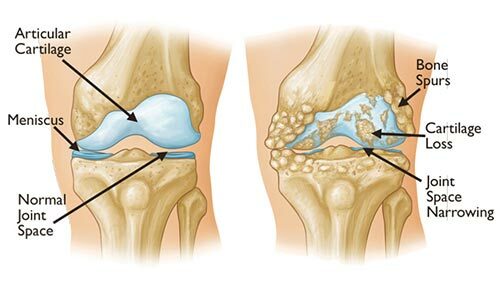 Sometimes degenerative arthritis of the knee can get complicated, which includes deposits of calcium crystals in the cartilage or even formation of the cysts at the back of the knee, known as Baker’s cyst. How is Degenerative Arthritis of the Knee Diagnosed? The diagnosis is made based on physical examination of the knee combined with X-rays and sometimes even MRI. However, X-rays are the most useful test for diagnosing degenerative arthritis of the knee. In an X-ray, your doctor will find a narrowing of the space between bones, calcium deposits within the joint if they are present, as well as osteophytes. Physical examination of the knee, will try to examine if there is any tenderness over the knee, the presence of crepitus (cracking and grating), swelling of the knee joint, any movement restriction, instability of the knee and even any possible thinning of the muscles that support the knee joint. Degenerative arthritis of the knee has no cure. However, some treatments help ease the signs and symptoms of this medical condition and its progression. Painkillers help control the pain and reduce the inflammation of the knee joint. Non- steroid anti-inflammatory (NSAID) drugs are also part of the treatment. These drugs tend to reduce the inflammation. Warm and cold packs are also helpful to reduce the pain, when applied directly to the affected knee. Steroid injections are sometimes administered directly into the knee. These injections tend to improve the pain for several weeks and sometimes even months. Hyaluronic acid injections are sometimes administered in order to lubricate the knee joint, when steroid injections don’t work. Surgery is the last treatment option, when the damage to the knee joint is so severe that no other treatment option helps reduce its sign and symptoms. Knee replacement is a good option for relieving the pain. Now replacements tend to last over 15 years.